Your business and home carpeting, flooring, upholstery and drapes cost a considerable amount of money. You paid handsomely for its functionality and aesthetics. Just like any other investment, your flooring, upholstery and drapes require carefully professional maintenance. A properly maintained floor will pay you back with years of durability and visual pleasure. Elite Recovery Team offers carpet and fabric cleaning services to help you maintain a new-looking surface. Regardless of whether your home or office has a unique type of fabric, costly Oriental Rugs or any other type of floor covering, the Elite Recovery Team can maintain it to improve its look and extend its lifespan. Too many homeowners make the mistake of assuming that vacuuming the carpet will get it thoroughly clean. The highest rated vacuum cleaners gather merely a small percentage of all the grime, dust, dust mites, pet dander and allergens in a carpet. Once you consider the fact that tiny insects live off of the dirt that your vacuum cleaner can’t collect, you will understand why professional carpet maintenance is so critical to the surface’s integrity and your home’s cleanliness. The only way to eliminate all those nasty little pests from your carpet is through a high pressure steam cleaning. 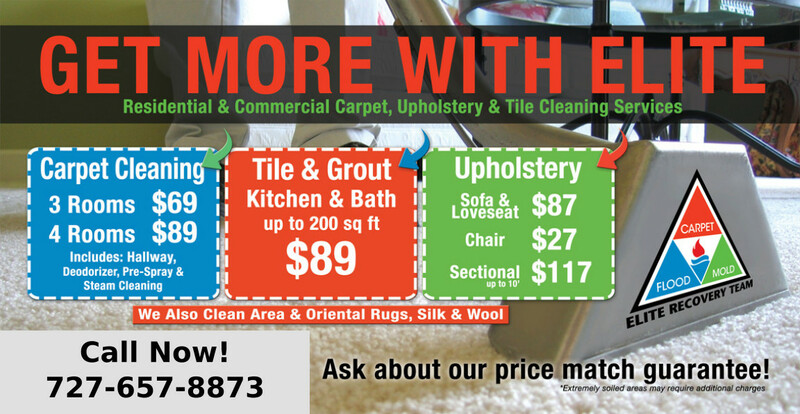 There is a seemingly endless number of ways to clean carpets and upholstery. Lean on our professional carpet cleaning technicians to perform a thorough analysis of your carpet and pinpoint the ideal cleaning method for your particular circumstance. We will take the time to explain the cleaning procedure in easy to understand terms and then get right to work. Sit back and relax while our cleaners performs the most intensive and thorough carpet cleaning service around. While there are all sorts of cleaning companies out there who will promise a high-quality carpet clean, we can confidently say that we are the leader of the pack. We sweat all the small stuff when analyzing carpets, figuring out how to best clean them and then perform the clean. We spot test, perform spot stain removal, carpet groom and pay attention to all those little nuances that our competitors often neglect. We understand that your carpet was a big investment so we spot test a very small part of the carpet before initiating our intensive clean. If we identify any problems, we will recommend an alternate cleaning method that will still get the job done to your liking. Carpets are inherently high-traffic areas. People walk along this surface throughout the day and night, leaving all sorts of dust, dirt and allergens. The application of a carpet protector is exactly what your carpet needs to stay fresh and stand the test of time. Once it is applied to your carpet, even more dry contaminants will be loosened up for removal. Back in the old days, rectifying a deeply set stain was nearly impossible. Most people would move the coffee table or lounge chair over the affected area in an effort to hide it. Thankfully, stain removal technology has drastically improved over the years. We have invested significant time, money and effort to develop reasonably priced stain removal solutions that are highly effective. We spot test areas to ensure the safety and effectiveness of each solution before applying it to the rest of the carpet. Dander, dust, mold spores, and bacteria accumulate over time and are compounded by inferior cleaning methods. The Elite Recovery Team is committed to reducing these allergens in your environment. Air Duct Cleaning helps eliminate harmful allergens that accumulate in your HVAC system. Everyone want to do all they can to ensure their home and business are safe, clean and as comfortable as possible. A great way to improve the quality of your time in these locations is to improve the quality of the air circulating in your home or business. Air quality can be dramatically improved by performing routine air duct cleaning. There are a hidden dangers in most homes that many homeowners and landlords are not aware of, and that is clogged or blocked dryer vents. Over time these vents and hoses fill up with dust and debris from normal use. Aside from losing efficiency in your dryer, when these dryer vents and hoses get blocked, they create a dangerous fire hazard. We encourage all homeowners to ask us to inspect your dry vent to ensure your families safety.